The exhibition “In the Name of Protest: Conflict in Photography” was born out of the events of the summer of 2011. Unlike other exhibitions which opened around the time that the events actually unfolded, this exhibition aims to pause and examine events which took place over a period of several decades of protest photography in Israel. The objective is to identify characteristics and trends, to present them in a broad context, and to examine their influence on Israeli photography. Of course, it is not possible to identify all of the elements – too numerous to count – which constitute the basis for creating protest photography, or any other kinds of photographs, whether they are socially, politically or culturally driven. However, a thorough examination of thousands of images allows us to adequately portray at least some of the content-related and artistic characteristics of protest photography. In addition to the significance of the characterization itself, it is important to define the methods and mechanisms which drive the photographers’ work, and to understand the effect these techniques and mechanisms have on the photographer while he is shooting an event – and also the way they affect us, the viewers, when we observe the images as they are presented to us. The character of the photographer and the content he or she strives to express are crucial elements, as is the message imparted to the viewers based on his or hers human, political and cultural points of view. Another important element is the way in which the photographer, as a unique individual, views reality, reflects it or reflects upon it as a witness to events as they unfold; this is especially meaningful when there is insufficient information to determine whether the events will have any historical significance. When thinking of images which invoke public protest, we might picture an angry mob gathered in crowded streets – swarms of people waving giant posters covered with emotional words and slogans, of striking graphics intended to catch and hold our attention, so that we will identify with the message of the protest. It is impossible to disassociate ourselves from this stark image of public protest; a successful movement must be visually distinct and communicate its objectives. Inherent in protests are conflicts which seek to achieve external manifestation and require broad public awareness, which in turn creates social pressures. To achieve this social pressure the protest needs to be dramatic and a call for immediate action are required. This exhibition examines these distinct aspects, but also attempts to discover other photographic, documentary and artistic resources for revealing the societal atmosphere or the characteristics of the protest phenomenon. The underlying aim is to recognize different, more intimate methods of delivering the messages of protest at an effective, sub-conscious level – images which will resonate for years, or which will be recalled years later. When these means are identified, an important element is added to the documentary process, and the political or social message becomes intensified and more effective. Research prior to the exhibition was initially focused on the effort to identify images of protests as extensions of non-verbal messages, the kind that would leave lasting impressions on the viewer and would be retained in one’s memory. However, it became apparent that relatively few photographers had captured moments of protest in this manner, since the phenomenon is by nature linked to immediate news reporting, as opposed to later reflection which is developed and synthesized over time. “Photography,” writes Thierry De-Duve, “is regarded in one of two ways: as an event, strange in appearance, a frozen format that conveys very little, if at all, from the flow of events occurring in real life; or it is regarded as a picture, an autonomous representation that can be framed and hung; but then, in an odd way, it is no longer a reminder of the specific event from which it was taken.” Following that last observation, we can conclude that when an image becomes an autonomous representation, its link to a specific event is severed; this is clearly evident especially in the images created by the art photographers participating in the exhibition. The major research interest in this exhibition concerns the ability to recognize and identify this representation which can be framed and displayed, so that even with the passage of time, it will remain an iconic image or symbol of a specific protest and era. Between these two poles: the journalistic and the artistic, the exhibition examines Israeli photography over a period of decades, and includes examples of enduring protest photography. David Rubinger, who is the most veteran among the photographers whose work is presented in the exhibition, has been documenting Israeli life over decades for international magazines such as Life and Time. He began his career as a photographer in the 1950s and documented the development of the state and its leaders over a period of 40 years. In addition to the history of the State of Israel, he photographed major figures in action as participants in historic events. Thus, in each and every one of his photographs, the human element appears. He was often a close friend of leaders and a welcome guest in their homes, among them David Ben-Gurion, Menachem Begin and Ariel Sharon. Rubinger emphasizes that, as far as he is concerned, photography does not exist without the inclusion of the human factor. When it is missing, he contends, the photo is incomplete. In his eyes, the human factor has infinitely more significance than the panorama or photographic space. At least one person appears at the center of every image Rubinger has photographed; usually it is a group of people whose relationship to one another tells a meaningful story, one that is often charged with dramatic content. Rubinger’s images document news events. He claims that when he is shooting an event, he gives no thought to the narrative. Rather, the images are captured instantaneously, almost “pursuing” each other as he attempts to capture the most important elements of the event, so that each image stands alone as well as portrays the entire story. Each photo describes a specific moment, one that will pass and fade away, creates and documents the historic moment – the one which embodies the story of what is happening in the public domain. The photographic space includes the central figures and attributes that complete the picture and tell the story that words cannot convey, such as the level of tension, or the eruption of emotions. For example, in the photo depicting the dispersion of a ultra-Orthodox crowd protesting archeological excavations, taken against the background of the yeshiva adjacent to the Wailing Wall in the Old City of Jerusalem, the conflict between the parties is captured, each in their characteristic dress or uniform: the policemen mounted on horses chasing the ultra-Orthodox Jews in their long black coats. The protesters, retreat and disperse in all directions by foot, while the policemen pursue them on horseback. Several different levels are evident in the photo; each of them reveals an autonomous element attempting to invade the space of the other: the police are breaking through the wall of the protesters and they, in turn, are occupying the central focus of the photograph. The overall drama is intensified due to the clear distinction between the different photographic levels. Even though the faces of the participants are not visible, their actions intensify the drama and reflect the tension characteristic of protests and conflicts. David Silverman, a photojournalist whose work focuses on recording the Israeli-Palestinian conflict, captured a scene showing right-wing political activists protesting in the streets of Jerusalem, while the police uses water hoses to disperse them. Here, too, we see an element which adds to the drama and action; in this instance, it is the strong torrent of water forcing the demonstrators to get down on their knees to defend themselves against the powerful spray. Here, too, similar to Rubinger’s photo, the body language of the demonstrators who crouch to avoid the spray of water, causes us to focus our attention on the confrontation between militant forces threatening to intrude on private space. In both of the photos mentioned, the human factor is very eminent and strongly influences the image. We are ostensibly relating to a single entity capturing two distinct sides to the conflict. Even a viewer who is unfamiliar with the background against which these events occurred can identify the two forces and understand what they represent: the attacker and the side being attacked. Intuitively, it seems, documentary reporting captures moments depicting universally recognized events, in this case individuals defending themselves in the face of aggressive forces. Depicting a crowd taking part in demonstrations as a single, representative entity is a recurring motif in almost all of Silverman’s photos. This phenomenon is particularly prevalent in images of the demonstrations which took place during the summer of 2011. Many of the photographers, whose images were reviewed for the exhibition, photographed crowds of demonstrators whose faces and identities were deliberately and consciously blurred. Excellent examples of this can be seen in the images of Boaz Aharonovitch, as well as in those of Daniella Orvin . This deliberate blurring also points to a certain freedom of expression in these photos. Mostly it points to the differences between a press photo intended to report objectively – or seemingly so – and a photo which is open for artistic interpretation. Both Aharonvitch and Orvin are artistic photographers, and as such, differ from Rubinger and Silverman. An artistic approach allows photographers to express their personal points of view and to inject them into their photos, thereby inviting the viewer to decipher the message behind the image. Occasionally, as in Aharonovitch’s photos, the photographer edits some parts of the photo, in order to intensify his message. While press photographers settle for cropping the margins of an image in order to focus attention or eliminate elements which do not contribute to the general picture, the art photographer feels free to interfere in a more direct manner in order to deliver his message. Blurring the crowd as it marches down the streets of the city creates a feeling of movement – a pleasant and vibrant sense of flow. A closer look at the photo reveals that, while the marching crowd is deliberately blurred, the signs hanging on electric lamp posts are viewed legibly in order to communicate additional messages. Particularly significant in this regard is an advertisement for the Italian fashion company Benetton which was planted in the photo as a lamp post sign showing Benjamin Netanyahu kissing Abu Mazen; an image that provoked repercussions in the international media, and is an example of the provocative advertisements for which the company is known. Thus, Aharonovitch slyly interjects a political statement into the scene of the social protest. The fuzziness that Orvin achieves by setting the camera on a tripod and keeping the shutter open for a longer period of time (up to 30 seconds), is meant to express the emotions of those taking part in the excitement and merriment as in some kind of a carnival, which echo some of the public’s feelings concerning the summer protest. The almost hallucinatory atmosphere is projected by Orvin through the foggy exposure, which also creates a feeling of chaos or the absence of order in one indistinctive crowd; thus, the multitude is seen as a single, multi-colored body in which the faces or individual identities of the participants are less important than the prevailing atmosphere. There are times, however, when unique, individual viewpoints deliver a stronger statement than that created by the mass protest itself; this is because an individual’s ability to arouse a sense of intimacy, internalization and emotional complexity is powerful. These cases of photos of individuals as part of a mass protest require a multifaceted involvement of the photographer in the photography process. The most important attribute of the photographer is his ability to capture the event and communicate its significance through the pictorial object – usually the prominent figure – thus expressing a heightened human sensibility. For most press photographers, this is a difficult task, one in which the sought-after result is rarely achieved. When the opportunity does arise, it is a uniquely captivating experience which leaves a lasting impression. Boaz Lanir’s photograph of the girl in the Lebanese city of Tyre, holding an infant wrapped in a diaper, succeeds in projecting an unforgettable and powerful image. The intensity of the photo stems from Lanir’s ability to capture the exact moment when the girl’s eyes reflect a range of unspoken emotions – from pain to wonderment. The image raises a number of questions, to which the answers are unclear: Who is this girl who during wartime has become a young mother before her time, and walks the streets of the city with the backdrop of an abandoned car that appears to have been hit by a missile? Why is this girl wandering about during wartime with an infant in her arms? What was her fate after the picture was taken? Lanir admits that even during the years when he served as press photographer for “Al Hamishmar” and “Shivah Yamim” (Seven Days), the weekend supplement of “Yedi’ot Ahronot,” he tried to create human portraits that reflect more than is shown in the frame of the image. A strong and candid portrait is achieved at the unique moment when the photographer succeeds in arousing the subject’s empathy, even though the image captures a random moment and the photographer isn’t acquainted with the subject, such as the image of the Lebanese girl. The viewer’s curiosity is aroused, to unravel the story suggested by the photo and its central figure. When the element of mystery is added to the image, and is presented with simplicity – the expression of the subject and message are open and direct – the photograph has succeeded in capturing that precise moment that will render it iconic and engrave it in our memory for years. A sense of quiet protest can also be achieved when there is more than one subject in the photograph. Rubinger shot a group of ultra-Orthodox women crowded together on a street corner in Mea Shearim, praying to protest a law which would mandate the enlistment of women in the army. An intimacy is achieved by shooting the scene close up and limiting the space around the tightly-knit group. The photographer seems to be intruding the group, yet only one woman looks directly at him, acknowledging his presence. The other women are oblivious to him and to their surroundings, concentrating on the prayer books they hold – an element which serves as the focus of the composition. 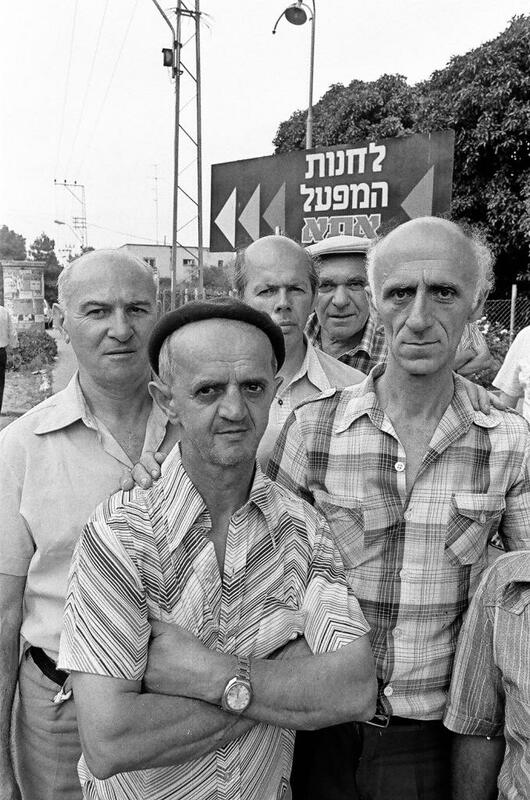 Another way to achieve intimacy can be seen in Boaz Lanir’s photograph of ATA workers demonstrating against a directive to close the local textile factory. Lanir succeeds in getting physically close to the protesters and captures their despair, apparent and clear in the look in their eyes. The sign in the background indicates the specific location of the event. 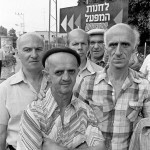 The closing of the ATA factory in 1985 was a significant point of reference in the decline of the Israeli textile industry: ATA was one of the veteran manufacturers – the largest and most well-known among them – employing thousands of workers and a symbol of the advanced textile industry in the country. The photo depicts the end of an era of Zionist industrial development, and the crisis of traditional industries succumbing to the low cost of manufacturing in the Far East. Photographs and films that documented the protest of ATA workers were also a source of inspiration for a video work by the photographer and video artist Nir Evron. The fact that the protest reappears in the work of a young artist, decades after the event itself, is proof of the power of memory instilled by the event and its imagery. In the video shown in the exhibition, “Echo,” Evron has taken news footage from the archives of the Israel Broadcasting Authority and has transformed it from journalistic materials into an artistic creation. In the process, he refreshes our memories of those news items, giving them new artistic life while simultaneously analyzing the quality and nature of the photographic medium. This work exemplifies the possibilities inherent in the process of recycling existing images and presenting them in new contexts, even after many years. Moreover, the work reminds us of the power of an iconic image – one that may remain relevant for different individuals, including artists, in a wide variety of situations. An iconic image is burned in our consciousness, and therein lies its significance; it succeeds in enhancing artistic expression, and in reawakening memories we have internalized. Thus, we are able to recall these images even years later, when the events themselves seem distant though somehow familiar. The exhibition “In the Name of Protest: Conflict in Photography ” strives to examine the field of protest photography from two parallel points of view: journalistic and artistic. As we study the transition from one field to another, we gain an understanding of the different objectives and approaches of the photographers, which invariably influence the nature of their work. The photographs in the exhibition also reveal the viewer’s significant role in examining the images and their various interpretations, a deeper inspection than that of a daily newspaper, which is mostly momentary and superficial. These photographs invite us to recognize and appreciate aesthetic values, and to understand how they influence the accumulated effect the photographs have on us. They leave a lasting impression over time, creating and reawakening memories inspired by these iconic images. Hagai Segev, curator and art critic, focuses on the varied facets of visual culture and how they reflect on contemporary Israeli culture. This entry was posted in Articles, Thematic Exhibitions and tagged Israeli Art, Israeli Photography, Photography, Protest. Bookmark the permalink.